Shelf FC’s bid to win the West Riding Challenge Trophy was ended at the semi-final stage last night. The Halifax AFL middle section champions lost 2-1 to Real Moor Real at the West Riding County FA’s Woodlesford base in Leeds. Defeat for the young Shelf side was no disgrace. Wakefield side Real Moor Real beat Monday’s Halifax FA Saturday Cup winners Huddersfield Amateur 4-2 in the last eight and also have a victory over West Yorkshire League champions elect Carlton Athletic to their name this season. Meanwhile, Ryburn United continued their pursuit of the runners-up spot in the Haslem-Sheppard Halifax AFL with a 6-0 win away to next-to-bottom Shelf United. 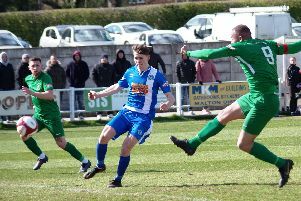 Craig Walker’s men, four points behind second-placed Northowram, host champions Illingworth SM on Saturday and complete their fixtures away to Warley Rangers on Monday.